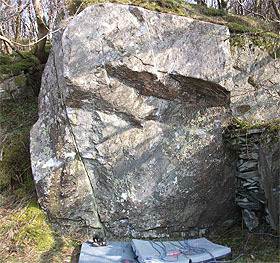 Phil Targett has found a good boulder close to the Braichmelyn blocks in Bethesda. Braichmelyn Bach is a steep wall with a good landing, and it gets the evening sun. It can be found by continuing on from the main Braichmelyn blocks, trending left and gaining a little height by a clump of small rocks until a drystone wall is reached. The boulder then lies just ahead. 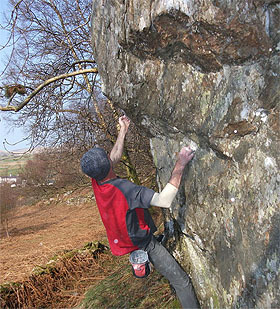 For the main problem, Braich Dancing V5/6C+, climb to the base of the obvious groove, gain a flake out left and slap the top. Exit leftwards. The steep arête, taken on its right side, goes from crouching start hands matched on the undercuts: Who’s Afraid of Virginia Woolf rates V5/6C. there is a further minor V1/5 to the left.